Cleveland's finest inflatable mascots decided to have a race this week. Check our Puffie, Swolly, Sir ROUND CC, and Air Moondog attempt an obstacle course- with hilarious results. Mascot Hall of Fame is Almost Open! The Mascot Hall of Fame holds its grand opening on December 216th, 2018. This museum will not only feature the fabulous mascots that were nominated to be in the Hall of Fame- but also many different, interactive displays celebrating the art of being a mascot. We were lucky enough to get a sneak peak at some of the amazing displays a week early, what do you think? 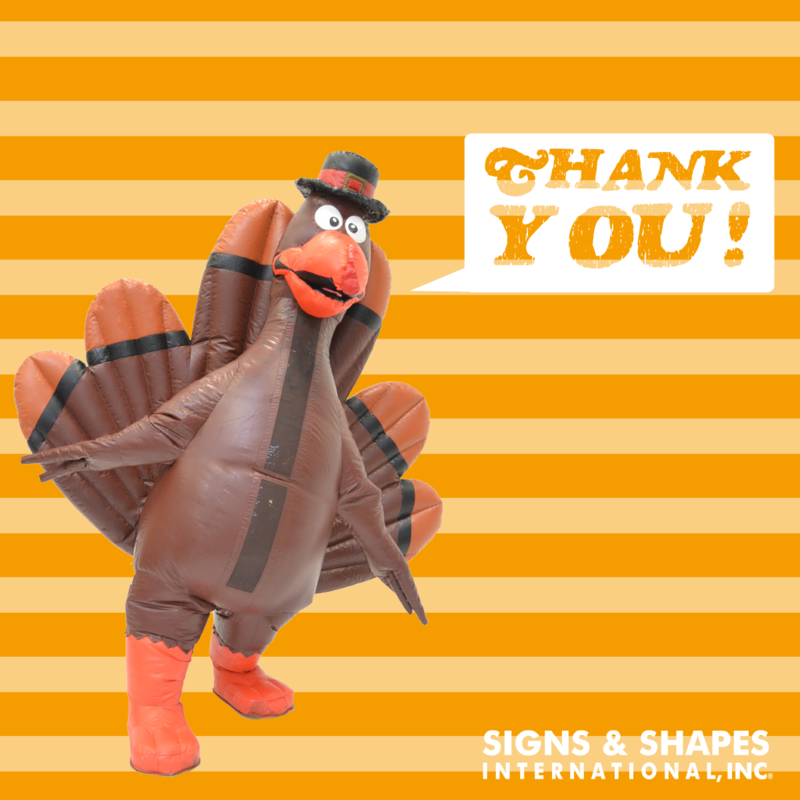 Happy Thanksgiving from SIGNS & SHAPES! This year and every year, we are VERY thankful for our customers. Thank you for allowing us to bring your crazy, brilliant, wonderful ideas to life. View this post on Instagram I ain’t scared of no @InflataBULL. #MIAvsHOU A post shared by TORO 🐃 (@texanstoro1) on Oct 25, 2018 at 6:10pm PDT FIND OUT ABOUT OUR GAMEDAY ENTERTAINMENT OPTIONS Watch Out for INFLATA-BOO! The inflatable mascot for the Houston Texans, InflataBULL, got into the spooky Halloween spirit by giving unsuspecting fans … Read moreHouston Texans’ Mascot INFLATA-BOO! Spurs’ Coyote Does the Baby Shark Dance! View this post on Instagram duunnn dunnn… duuuunnnn duun… duuunnnnnnnn dun…dun dun dun dun dun dun dun dun dun #babyshark A post shared by The Coyote (@spurscoyote) on Oct 18, 2018 at 1:28pm PDT FIND OUT ABOUT OUR GAMEDAY ENTERTAINMENT OPTIONS Inflatable Mascots do the #BabyShark Dance! During their season home opener, The Coyote of … Read moreSpurs’ Coyote Does the Baby Shark Dance!